File image of flooding in San Jose. 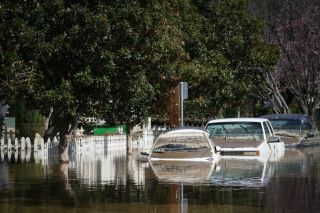 Approaching the one month mark since high-rising water overwhelmed several homes and cars in San Jose, state and city leaders on Saturday turned out to tour the damage and check in on the status of cleanup efforts. Sen. Jim Beall, Assemblyman Ash Kalra, Santa Clara County Supervisor Cindy Chaves and others were among the dignitaries in attendance. Flood victim Jolene Noel, who witnessed her basement swell with water back in February after the swollen Anderson Reservoir spilled over and overwhelmed neighborhoods along Coyote Creek, was delighted to see government leaders at the scene of the destruction. "I hope it helps," she said. "Hopefully they'll help us out and help these people who have suffered even more than we have." Despite the elected leaders making an appearance, Noel still called the cleanup and repair process "aggravating" and "exhausting." She has to replace a gas line and repair damaged electrical lines before her family can move back into their home. She added that some of her neighbors have it even worse. Nearly 70 people continue to spend the night at the Seven Trees Community Center, which has served as the main overnight shelter for flood evacuees since February. Last weekend, the number of people taking shelter overnight at the Seven Trees Community Center was 117, according to city officials. A total of $1.4 million that was contributed to the flood victims relief fund has been doled out to a number of households as of Thursday, according to city officials. That money was spread out across 502 checks. Wet weather is expected to return to the Bay Area by early next week, but the new round of rain is not expected to cause the Anderson Reservoir to spill and create more flooding concerns, according to city officials.